By having vinyl siding from Roland Slate Service Company installed on your Perry Hall, Maryland, home you can increase its insulation by up to 37 percent. As such, you will make it easier for your HVAC unit to maintain a cozy temperature inside your home, thus potentially reducing your monthly energy bills. Another advantage of buying vinyl siding from us is that we offer comprehensive warranty protection on all of our siding products. Not only will you be protected by a comprehensive lifetime material warranty, but you will also enjoy a labor warranty that supports all the work performed by our expert technicians during installation. 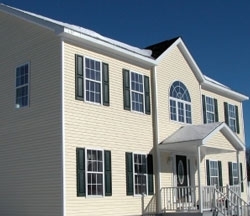 To learn more about the features and benefits of the premium vinyl siding that we offer, contact Roland Slate Service today and schedule a complimentary consultation at your Perry Hall, MD, area home.Make sure to ask about the financing options we offer which can make your purchase of new siding even more affordable.